Online shopping and eCommerce is a multibillion-dollar industry. It’s expected to grow by more than 20% in just this year. Sure, it all starts with a great product, but a powerful site supports its customers through every step of the way by creating a positive, effortless user experience. 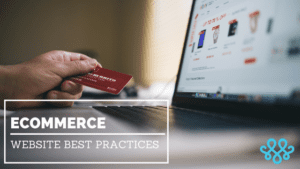 Here are some eCommerce website best practices to use! With more Google searches conducted on mobile devices than desktops, it’s time to meet your customers where they’re at. Make sure your eCommerce website is mobile friendly. These are things that prompt user interaction, such as an email or newsletter sign-up in the footer or in a pop-up. Also, things such as a button to click to get a promo, social media links or even just a button that says “click here to learn more.” These are important because they have the customer interacting with the website. This helps relate and enhance customer experiences and to connect with their emotions. This makes customers feel less pressured to visit your site just to make a purchase. Another bonus is that it is a great SEO practice! This builds trust and confidence in the product that they may be purchasing. Having beautiful photography doesn’t mean you need to hire a really expensive photographer, but it does mean a time investment in capturing the right photos of your various products, services or whatever you want to portray. This will help entice people to look through your offerings and buy. Also, try to create a consistent look and feel across all the photography used on your e-commerce website to help make the experience of browsing and shopping more enjoyable. Ensure that the structure of your website is organized in such a way that it is both easy for visitors to browse and easy for search engines to understand. Build in “breadcrumbs” on your web page, this allows for ease of use of webpage and more streamlined navigation. It will keep the customers focused on the areas where they have already expressed interest in. This consists of conversion rate, time on site, number of pages visited, top pages, top products, products commonly purchased together, new users and where they are coming from, etc. DON’T ALLOW FOR A STAGNANT SITE! Make sure to keep images, graphics, promotions changing every so often so that the customer feels compelled to come back. This includes internal and external hyperlinks. This is another great SEO practice. Customers appreciate snippets of information tucked in with their shopping experience. Reminder to also make sure external links are opening in a new window or tab so that it does not direct your traffic away from your site! Social media has been gaining momentum for a long time. Major platforms (Facebook, Instagram, Twitter) won’t be losing relevance any time soon. The influence of social media is undeniable, and the constant nature of these platforms makes it a great opportunity for visibility. Keeping an active social presence means customers keeping your brand top-of-mind and keeping up to date with any information you may post. Customers want to know all of the important details about the products they may be purchasing. They also want it clear, concise and to the point. Product photos should give a high-level view of a product, a close-up detail shot, as well as multiple different angles of the item to ensure a person can see as much as possible since they don’t have the item in hand. 51% of Americans prefer to shop online and that statistic is only going to keep rising. 96% of Americans have made an online purchase in their life, 80% in the past month alone. So – if your eCommerce website isn’t using any of these best practices be sure to change that now. Using these eCommerce websites best practices will leverage your brand and what you are trying to sell, keep your customers coming back to your site and most importantly increasing your sales!